As I was finalizing my shopping cart at KangarooBoo (Remember: today is the last day to save 20% on your order with the code: BIGTHREE), I became captivated by their extensive collection of mobiles. Now, when I think of mobiles, I think of the ones hung over a baby’s crib. And granted, these can serve that purpose, too. But as I explored all the options, I began to see mobiles as a wonderful gift idea, from newborns to adults! 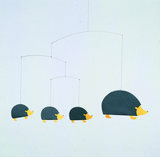 How fun it would be to have these hanging in the kids’ bedrooms, playroom or even a kitchen, entryway or family room! I love the story of the company that makes these, too. Established in 1954 by Christian Flensted and his wife Grethe remains a family business more than 50 years later. Flensted mobiles are modern, simple yet elegant design that stimulate the imagination, at the same time soothing and relaxing to watch. Flensted Mobiles are created so that the elements are in constant motion while the entire mobile maintains a harmonic balance. Each mobile is carefully assembled, and balanced by skillful hands by artisans from their own homes and then collectedly twice a month by the company car. This practice has been in use for more than 30 years in which the process allows employees to work from home and leave less carbon footprint on the planet. 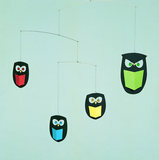 Not only are Flensted Mobiles beautiful but they are made in an eco-friendly manner. This one would be so cute over a crib or even in a family room. Other colors are also available. Owls are so “in” right now. I love the colors of these wise birds. Hedgehogs! How cute are these?! 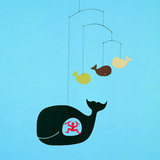 I love this mobile of Jonah and the whale. What a great reminder of God’s protection! These puppies would be so cute in a kid’s or baby’s room! 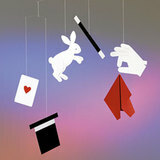 Since I have a budding magician at my house, this immediately caught my eye. Ballet dancers— I love this because it’s not your typical “pink ballerina” design. This is available in several colors. I think it’s beautiful and would look lovely anywhere in the house. 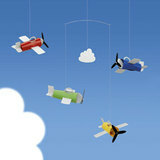 If you know a boy who loves anything that flies, this would make such a fun gift! I can see this in a kitchen or dining area to add a touch of whimsy. 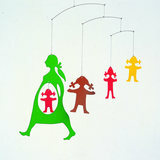 Check out the rest of the mobiles at KangarooBoo.com. And order TODAY to save 20%! Next Next post: All I Really Need to Know I Learned in Kindergarten—Really?